Here it is folks, the final issue of the McFarlane/Michelinie Omnibus. It's been a wild ride, let's close it out with a bang. This opens with our recent villain Sebastian Shaw overlooking some new sentinels. His doctor assistant has made the connection between a Dr. Max Lubish conducting experiments at ESU around the time Spider-Man got his cosmic powers. Shaw is anxious to speak to the good doctor and get some answers. Back in NY, Peter is having some trouble helping MJ with her lines and she suggests he go out and take a swing. Sometimes the fresh thin air can help when clearing your head. While he's out on his swing stopping petty crimes, Shaw has arrived at ESU and is forcing Lubish to help him by blackmailing him. Everyone's got their secrets which are always kept...unless you're a villain. Then you know everyone's secrets. They're uploaded when you wake up. Back to reality now. All the villains so far in Acts of Vengeance are still dealing with their losses, Graviton is flying around but hurt, and even up in space Loki is pissed at the mortals. So pissed that he uses his mischievous powers to bring together the three sentinels from the beginning of the issue. They have now combined to form one massive super dangerous Tri-Sentinel!!! Spidey's senses pick up on it quickly and he sees the Tri-Sentinel is making it's way for a near by nuclear plant and he's the only one who can stop it. Bit of course, because Graviton was there before, he makes another appearance but it dealt with quickly. Spider-Man gives him a good cosmic shot to the chest since he can't be bothered with him right now. And he's out for the count...again! Things can't be that easy though, on the way to the plant, Shaw finds Spider-Man and hits him with a shot from atlas a cannon thing thing. This only awakens something deep in Spider-Man and he actually becomes Captain Universe! Behold, the birth of Cosmic Spider-Man!!! He says he was chosen to hold these powers which is why the experiments before didn't kill him. Now the fight is really on between Spider-Cosmic-Ultra-Hyper-Man and the Tri-Sentinels. The battle of the hyphens commences! He can't get around the Sentinal and attack from a distance so Spidey has to go head on, physically trying to tear the robot apart! Shaw eventually catches up to the fight and shuts the Sentinel down himself since they're super expensive and knows Spider-man would win the fight. What he doesn't know is Spidey can now shoot out pure, raw, cosmic energy from his body and he shoots his entire tank. If it weren't for his Spider Powers, he'd probably be dead. At that moment, the Sentinel takes one final swing at a containment tower but Spider-Man blocks it with more cosmic energy and a massive explosion happens. This image takes up the entire page with bright colors and incredible action of the Sentinel exploding. 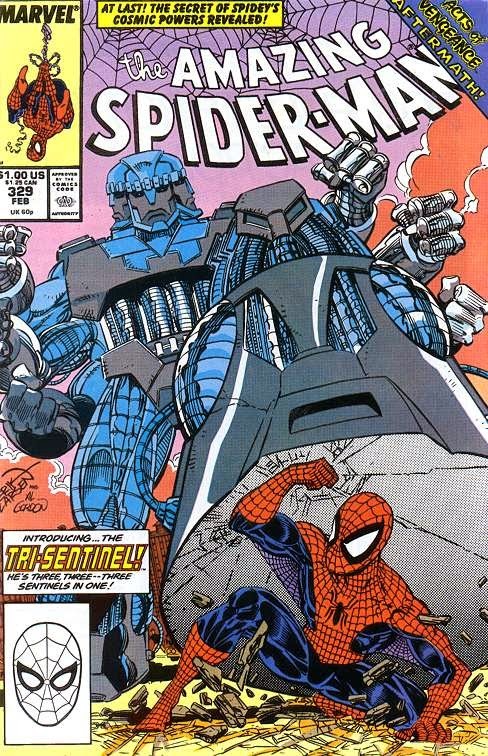 Spider-man has reduced the Sentinel to literally nothing. The entire robot disintegrated, but in doing that, he's also expended every last bit of his cosmic power. He can't fly, can't change the matter of his web. But he can take a nap in the woods until he wakes up a couple hours later. He finally comes home to his supporting wife and a knock at the door. It's their friend Flash Thompson. He's been having trouble with women lately but he thinks he's finally found the girl who's right for him. She's a young, hot, white haired girl named Felicia Hardy! This spells nothing but trouble for Spider-Man, and Peter Parker as well! This has been a true honor to read and write about this collection of stories. Since I was a small boy, Venom was always one of my favorite villains in the Marvel Universe. He was everything Spider-Man, my favorite hero, was but bad! It only gets better than that if you paint him red. Reading an entire book with mostly his work on my favorite characters and seeing the birth of one of my favorite villains is inexplicable. I have also grown to absolutely love the work of David Michelinie, as he was able to tell an incredible story that spanned over thirty issues. It felt like one giant issue, not one bit like it was chopped and screwed in any way. I can't say enough about this collection, and I can't wait to bring you more stories from more Omnibuses in the future. Until next time!